Wayfield Foods Weekly Ad Specials valid April 22 – April 28, 2019. 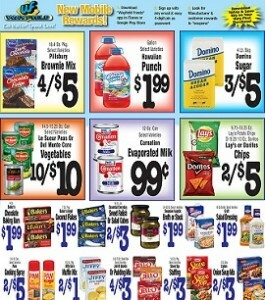 This Week Ad best deals, and grocery savings on: Sunnyland Hotel Brand Sliced Bacon; Baker’s Chocolate Baking Bars; Progresso Vegetable Classic Soup; Kraft Salad Dressing; Swanson Aseptic Broth or Stock; Fresh Frozen Vegetables; Kellogg’s Eggo Waffles; WestPac Premium Vegetables; Essential Everyday Sweet Relish; Turkey Hill Ice Cream; Fresh Boneless Chicken Tenders; Lean Fresh Whole Pork Ham; Meaty Country Style Pork Ribs; Fresh Small Pork Spare Ribs; Premium Leg Of Lamb; Fresh Whole Turkey Wings; Sugardale Shank Portion Smoked Ham; Tender Baby Back Pork Ribs; USDA Lean Boneless Pork Sirloin Chops; USDA Choice Beef Cube Steak; Fresh Green Asparagus; Fresh Juicy Whole Gold Pineapples; Fresh Ripe Golden Bananas; Fresh Ripe Organic Avocadoes; Stalk Fresh Crisp Celery; Fresh Never Frozen Catfish Nuggets; Fresh Salmon Fillets; and much more. Find all deals, offers, and prices in the latest Wayfield Foods Weekly Sale Ad Specials.